Great Set Up in busy center-way under build out cost! 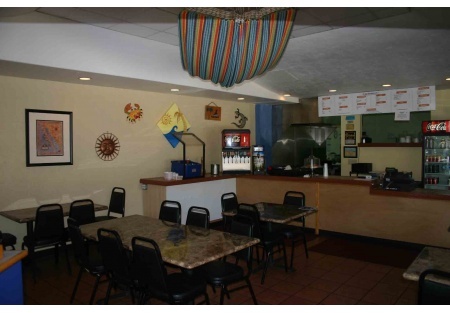 Here is an absolutely turn key Mexican food shop that is priced to sell. The ownership group is going their separate ways and is now making this opportunity available for you. Don't miss out on this outstanding opportunity to get in for less than the cost of build out. The place was professionally designed and built in early 2010. All the equipment was purchased new and still is in near new condition. Equipment has been meticulously maintained and some pieces are still under the manufacturers warranty. The food is delicious and the reviews on Yelp show this place is well on its way to becoming a local favorite. Sales are up over last year and that is impressive. You simply will not be able to duplicate the value recieved here for this price. With out even trying they are averaging $ 400/day, easy opportunity to increase sales here. They currently close at 7:30pm and are not even open on Sundays. Want more sales? Open for breakfast, expand the hours and open Sundays. Catering opportunities are tremendous and are just starting to be explored. If you have the desire this place will reward your dedication. Located in the heart of La Mesa in a very busy shopping center anchored by a large grocer, several banks and many other big customer draws.Huge street traffic passes by daily and they are with-in walking distance of many large employers. The space is approximately 1200 square feet, rent is $1800/month plus approximately $350 for CAM. You are looking at less than $2200 for total rent! Current lease term ends May of 2013 with a five year option available. Don't miss your chance to get in cheap. Now is the time to move on this great opportunity.